Find My Workspace lists over 95% of the coworking space & business centers market in Grenelle. Simply click Request Quote to check pricing for one office, or Add to Basket for multiple offices. 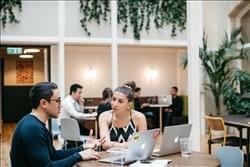 Found right in the heart of Paris, this business centre is a brand new coworking space ideal for any business, whether you are a new start-up or existing well-established business. Offices range in size, making them suitable for any size team – no matter how big or small, the space can be customised for you. The site is also dog-friendly, and you will benefit from a flexible event space in which you can network with like-minded colleagues or international clients. The centre also has plenty of communal spaces, including printing and copying stations, sound proof phone booths and break lounges. To obtain information for your selected Grenelle Coworking Space & Business Centers, please tick the "Add to basket" box for each office you prefer and complete the form below. We will then send a detailed report via email.